Designed to answer tradesmen demands for versatility, power and control, the new Bosch IDH182 18-Volt Lithium-Ion Impact or brings to market an industry first with its Socket Ready adapter. This adapter allows users to seamlessly change between 1/4-Inch screwdriver bits and 1/2-Inch sockets, thus removing the need for two tools or the hassle of broken socket adapters. Featuring innovative solutions such as the Socket Ready all-in-one tool holder, the IDH182 provides users with unmatched solutions to get the job done efficiently and effectively. The IDH182 is equipped with Bosch's next generation EC Brushless motor, which provides 2X motor life, superior efficiency for longer runtime and absolutely no maintenance. This tool also features intelligent electronic cell and motor protection engineered to increase tool and battery life, along with the Bosch-built hammer and anvil system that delivers maximum impact endurance and increased tool performance in wood and metal fastening applications. To complete tougher applications with maximum efficiency, the IDH182 delivers 1,650 in lbs of torque making if the most powerful impact driver in its class. Adjust tool speed and torque with a push of a button to maximize power or minimize fastener damage with the Bosch Performance Control System. 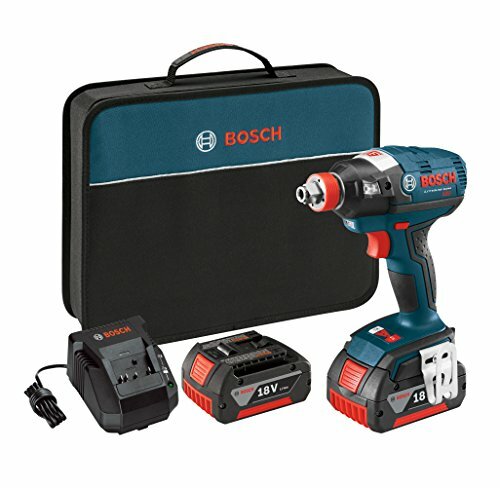 The impact driver also features a compact head length of 6.2 Inch and weighs just 3.2 pounds when paired with a 2.0 Ah battery. In addition, the IDH182 is designed with the smallest grip diameter for best-in-class ergonomics and comfort and features the patented three LED design to provide maximum illumination of the work area without shadows. The IDH182-02 Kit Includes: (1) 18-Volt Brushless Socket Ready Impact Driver, (2) 2.0Ah Batteries, (1) Charger, (1) Double-ended Impact Bit, (1) Belt Clip and (1) Carrying Case.